A few weeks ago I purchased a box of Tristar's new 2011 Obak Baseball. 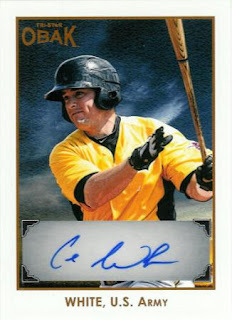 I was disappointed that 50% of my hits were of the same player, Cole White. An interesting story, Cole White is a graduate of West Point, did a 2-year tour of service and returned to the Pittsburgh Pirates organization, the club he was drafted with in 2008. Now the cards were each serial numbered to different numbers, one to 50 and one to 75, but as you know, that doesn't make it a different card, and if you try to argue that, you are just wrong, but that is a topic for another day. I contacted customer service via email and about a week later got a reply asking for proof of purchase and was told that they would then replace the duplicate auto with another randomly chosen autograph. Great! I forwarded a copy of my invoice (the product was purchased online) but then received and email asking that I first provide an image of the two cards side by side. Fine. No problem. Done. But then I get an email saying to mail one of them back. At that point I went, politely, ballistic. What!?!?!? Are you kidding me!?!?!? I have already wasted enough time on dealing with an issue that wasn't of my doing. All I did was buy your stupid product. No in a bush league move instead of just comping me another auto to make me feel that I at least got some value for my $100, you want me to send you the card!?!?!? Bush league bullsh*t is what that is. Now, I obviously didn't say it in those words, with that tone but you get my drift. Well, anyway I got a reply saying that the customer service rep I was dealing with would talk to their manager and get back to me Monday. (This was a Friday). Well, I was happy to get a reply back saying that I would be receiving replacement autos in the mail. The plural of auto made me curious. As I felt one autograph would be fine. Instead today I received two autographs. 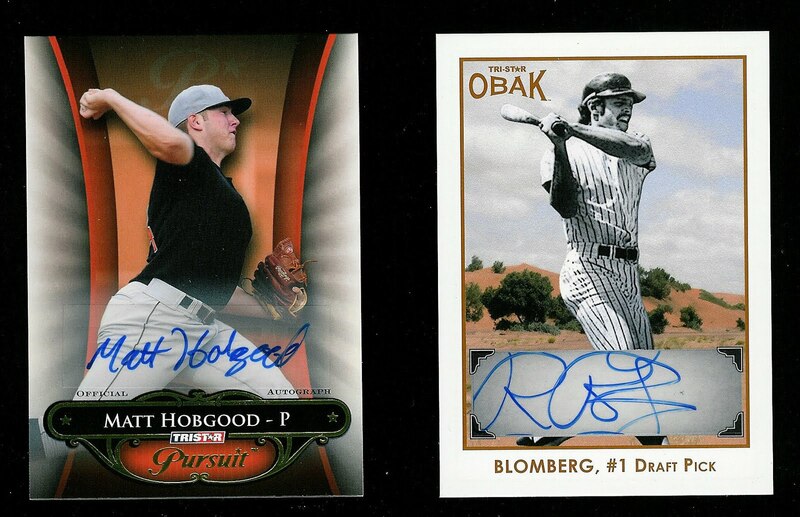 A replacement for the Obak dupe, this one of Ron Blomberg numbered to 4/50 and the other from 2010 Pursuit of Matt Hobgood numbered 80/80. So all's well that ends well. Now a question. Why weren't these cards included in the pack out. They are both on the checklists at those numberings. Does the company keep a handful of boxes and these were pulled from those boxes? Were they reprinted and the numbering added randomly? Did they go buy a box back and pull them from there. Remember all Tristar boxes are numbered as part of the overall security of their print run. It actually seems reasonable to me that some boxes will have the same card, different numbering. Odds kind of dictate it is a possibility. Don't blame you for being disappointed but seems like a over the entire run it will happen a few times. If they were monster hits, none of us would object. I don't have inside knowledge, but it also seems reasonable that card companies would retain a certain amount of hits for various reasons. Replacements for damaged cards, fulfillment for other redemptions that don't get returned by players, etc. While this concept might seem like cheating collectors, I can't see how companies can function without doing this. Another thing to consider are NPN (No Purchase Necessary) programs. Unless Obak is hand collated, there is a sweepstakes nature to the way a collector receives hits which requires the ability for anyone to be able to "win" a hit without having to purchase a pack. Part of the requirement is that anyone who sends in an entry through a NPN program has the opportunity to win any card at the same odds as they are distributed. I'm sure that companies have a good idea of how many entries they will get and then have to hold back cards to fulfill all of those entries. I would guess they would even have to hold back a 1/1 or two. I would think that eventually all these cards would make their way into collectors hands, but not alway through ripping packs. I could be wrong about all this, but it seems logical to me that this happens. Congrats on the Ron B. Nice looking card. Great points. Thanks for the reasonable answer and you are right, you get two Cal Ripken's and nobody, myself included says boo. All valid points. In 2001, I was a Senior Manager at Playoff. I took the job to bust them for fraud, but that's a story for another day. Card companies ALL keep about 20% of all inserts from pack-outs to use as replacements. Some companies keep them as un-serial numbered so when they replace them they can put the same exact serial number on the replament card as the damaged card. Card companies also have oveflow of all inserts. These are cards that were supposed to be in packs, but never made it in for their own reasons. Playoff did this so they didn't have situations where some boxes had no inserts because they ran out. So they told their printer to set the insert rate where there would always be overflow.